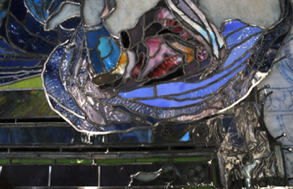 The lifespan of the lead matrix that holds a stained glass window together depends upon the design, proper support, and the original composition of the lead alloy. 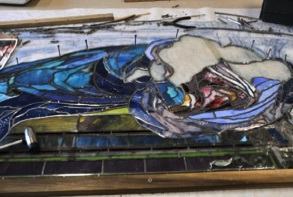 Adhering to best practices of conservation, releading of a stained glass window should be limited to the areas where the lead has failed due to fatigue and deterioration. This is referred to as partial releading, where the minimum intervention is carried out. Where the lead has failed, the old lead must be removed and replaced with a restoration-grade lead alloy matching the size and profile of the original. Some studios use the “one size fits all” approach and philosophy, where every stained glass window must be completely releaded after the magic “100 year” mark. This is a misrepresentation of truth and facts, and although sometimes it is based purely on lack of experience by the studios representative, most of the times it is used as a “scare tactic”. Unfortunately, but understandably so, most stewards of stained glass windows and or members of the Clergy, lack the knowledge and of course if they are told that “if you don’t remove these priceless windows and completely relead them soon, they will fall apart and collapse” they panic and buy into the scam. It is important to understand that when a window is completely re-leaded, the lead lines are no longer those of the original craftsman, and that is a loss. 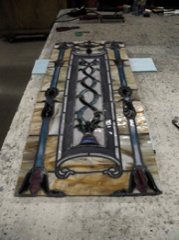 The lead lines in a Tiffany or La Farge window are as important as the trace line in a painted window; every effort should be made to save it. The truth is that it takes a lot more skill and knowledge to properly preserve a window or sections of a window and its original lead, than it is to completely dismantle it and put it back together, in the hopes that it will be put together properly and as it was originally. Plus it is a sure way to keep their large staff employed. Be aware, ask questions, familiarize yourself with the different options. Don’t be fooled by impressive, flashy color brochures and literature filled with false statements and dishonest facts. We are not saying that stained glass windows never need to be completely releaded. There are times when depending on all of the facts mentioned above, it is inevitable to completely re-lead a stained glass window or windows. 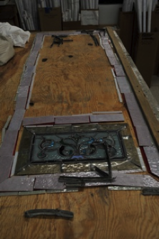 What we at Serpentino believe is that there is no magic number or date to when a stained and leaded glass window must be completely releaded. It is important to understand that deflection in a stained and leaded glass window is not always an indication that the lead matrix has deteriorated and must be replaced. A responsible, conscientious conservator must have the knowledge and experience to recognize why a window, or particular area of a window, has deflected as well as determine the condition of the lead matrix, and abide by the Code of Ethics written by the American Institute of Conservation (AIC), in executing the work with the highest level of craftsmanship while maintaining as much of the original materials as possible. Below are some photographs taken during restoration, conservation and partial releading of a series of 1890 La Farge windows restored for Salve Regina University where we restored 13 windows by the artist. Madonna and Child during conservation. Only where necessary was the lead replaced, saving 85%-90% of the original lead matrix. As you can see from the center photo, only the cracked pieces were removed from the center decorative section of the window. 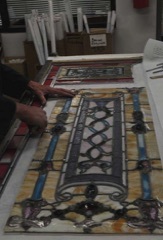 After glass repair, the pieces were reintroduced and their original 1890 leads reused. Pompeian style window before restoration. Pompeian style window after restoration. Only the borders were removed and dismantled for re-leading due to lead fatigue. Central section was left intact as the lead matrix showed no lead corrosion. Central section reintroduced within the re-leaded borders.